With more than 2 billion people active on Facebook, how can you attract their attention and make them your customers? These 5 steps will show you how. First things first, my golden rule before starting any new marketing project is to always have a goal. Getting more business doesn’t count as a goal, it’s too broad, you need to be quite specific here if you want to actually achieve anything. If you don’t know where you’re going how do you know when you get there? A classic anecdote but a very important question that needs to be asked when it comes to marketing yourself. Depending on what type of business you run will determine the goals you set, I have put together a list of example goals to give you an idea of how specific you need to be. You’ll notice I’ve included actual figures to my goals, this is important, not only will using real figures get you to realistically consider your priorities, it will also make your goals more trackable. The other thing about giving your goals a value is getting the difficultly level right, there’s a bit of a science to it. If the goals is too hard you will be demotivated, if the goal is too easy you will be become bored. The goal needs to be set just on the edge of your capability level, not too hard, not too easy, just right. For the full run down on the science of goal setting, I encourage you to read ‘The Goldilocks Rule’ by James Clear, it’s an interesting one. So, pick a goal, whether that’s to increase your online sales by 10% next month or to have 20 new people sign up to your newsletter, stick to that one thing and give yourself a realistic time frame to achieve it. Start with your cover photo, this will be the first impression people get of your facebook page so you need to make it a good one. 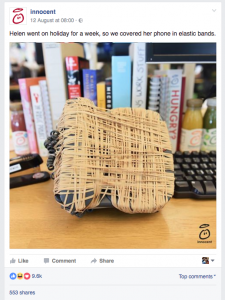 Your cover photo will show up in a few places on Facebook, when someone hovers over your page name in a post and in suggested pages, so it’s worth adding a tag line on the photo, something punchy that tells people the benefits of liking your page. If you want to take it to the next level, You can change your profile picture to a video, this is a nice way to introduce yourself and what you do to your audience, and with a massive 90% of video views on social media it’s worth tapping into that. Another thing to do, is complete the ‘About’ section of your page, and not just your address or opening hours, but use actual information about you as a business and use key words too as this section is indexed in Google. This is also a good place to link back to specific pages on your website you want highlighted. One of the biggest pulls for people ‘liking’ or following your business on facebook is that they’ll be in the know about events, promotions and special offers. Your followers will also like your page to get a deeper insight into your business. To begin building an audience, your first port of call should be to get your current customers and friends to like your page. This is a quick way to reach out to more people. Once your audience begins to grow, look after them, listen to their needs and respond to them through your posts. Make it personal, if someone engages with you, always respond. You need to see every like, comment and dm (direct message) as an opportunity. Here’s a little trick to make it feel special – if someone has liked your page, acknowledge it by either liking them back or writing a little ‘thank you for your like’ post on their wall. It’s nice and it makes people feel good. And if you’re making people feel good you can bet your bottom dollar they’ll tell someone about it. One thing to remember, that I find a lot of business pages forget to do is like or follow other people and businesses, especially local and inspirational ones. By building your ‘liked’ list you will develop a healthy stream of content in your home page – ripe for sharing. So, now you’ve got the undivided attention of your following, what do you post? The biggest way people are going to interact with your Facebook page is through your posts, so you need to know what your posting and how often you’ll be posting. Forget about the hard sell, over promotion is just annoying. The occasional trumpet toot is ok, providing your brand or business has done something newsworthy or is up for an award, otherwise your audience will see through it. Your content strategy needs to appeal to your audience’s emotions, remember people are on Facebook to be sociable and have fun, so content that’s strong, conversational and evokes an emotional response is going to build a stronger engagement and get you more likes and shares. People are more likely to comment or share content that has the feel-good factor or that has positive associations. Try swapping your usual ‘here’s what’s happening with us’, or ‘another one of our products’ posts for something fun, something you’re interested in and would share on your own personal timeline. 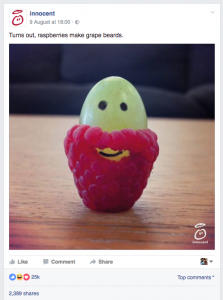 I particularly like the grape beard post, it involves fruit, it’s creative and funny – totally on brand, and look at the amount of shares, an impressive 2389! Other good sharable content are ‘How To’s’, giving your followers tips and insights into your world will be much appreciated and most likely shared. Find stories (news, etc), and either share and comment or create your own post around the subject. This needs to be a balance of your products and services with products or services related to you that you have been inspired by. News News specific to your business. But each post needs to be consistent with your business, the language you use, your opinions, whether you are funny, serious or thoughtful, whatever you are it needs to be the same for each and every one of your post. It’s worth setting yourself ‘post guidelines’, this could be as simple as a checklist that you go through before posting something to your feed. This will make sure all your posts are consistent, and that you’re really pushing your business in the right direction. I would recommend you create a social media content plan, so you can plan posts in advance and be in full control of your Facebook updates. You can download our Social Media Content Schedule Template or you can create your own, but it makes the process much less daunting if you have a whole week (or two if you’re feeling up to it) planned out. There are also free tools like Hootsuite and Buffer that can help you manage and schedule your posts, these are worth checking out if you have multiple social media channels that need managing as you can view more than one channel at a time. If you have the budget, Facebook advertising gives you the opportunity to really hone in on your audience and reach out to new people who are similar to your existing customer base and that are likely to be interested in your business. You can target a specific audience in detail, using information from their profile like their gender, where they live, and their interests; this makes sure your ads only reach a targeted audience, chosen by you – making your campaign more likely to succeed. For a more detailed ‘How To’ guide on setting up your facebook ads, read How to set up Facebook Ads – a step by step guide to advertising on Facebook by Hubspot. It’s nice and easy to follow and takes you through all the tools and functionality of Facebook Ads with some handy checklist and screenshots. Quickly going back to the Goldilocks Rule of goal setting, another part to the theory is being able to measure your progress, it’s all to do with hard work and happiness, and how that keeps you motivated, (you really need to read it – if you haven’t already). There are a few different ways you can track your goals depending on what they are. It enables you to look at each of your posts and see which ones have the most reactions, comments and shares and the least negative feedback. You can take this information and use it to create similar types of posts that your audience are interested in seeing. You can also find out when your audience is on Facebook so you can schedule your posts to go out when you’re likely to reach more people. The other way to track your progress is by using Google Analytics, this can tell you how much of your website traffic is coming from your social media channels, all social media channels not just facebook. The difference with Google analytics is it enables you to go deeper, it will show how your visitors behave when they’re on your site and by tracking and measuring your social media initiatives you can then start to prove the ROI (Return On Investment). If you don’t have a Google Account set up, visit google.com/analytics click on the sign in button at the top right corner and follow the instructions.